We removed the battens and glass from the large thermal mass wall on the south side of the house to get ready for the new window install. 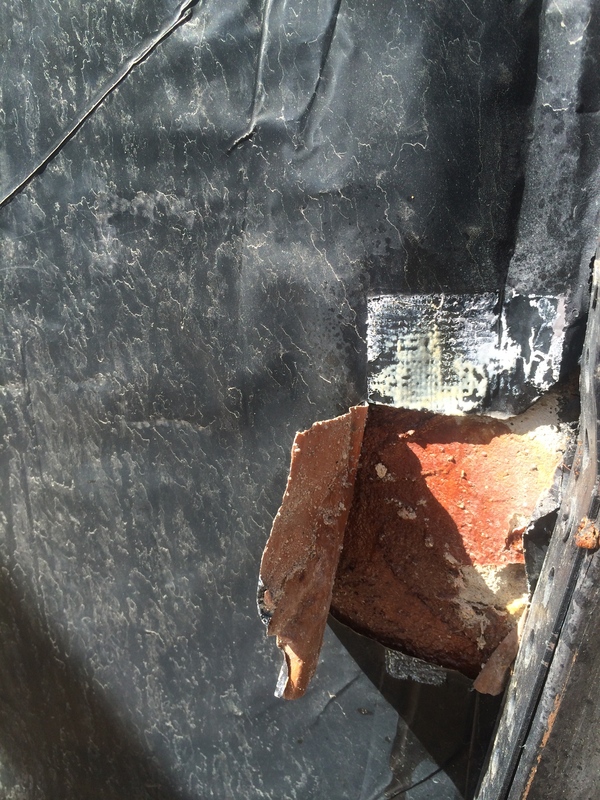 This Trombe wall had a solar glass covering that was deteriorated and needs to be rebuilt. The question has been whether rebuilding as a trombe wall is energy efficient. We had the architect use a stone covering in his drawing to imagine what that might look like instead of the glazing. After visiting Amory Lovins house in December, I did some research on the thermal mass wall to determine what “effective R value” the mass wall would have vs. just the actual R value from the masonry. 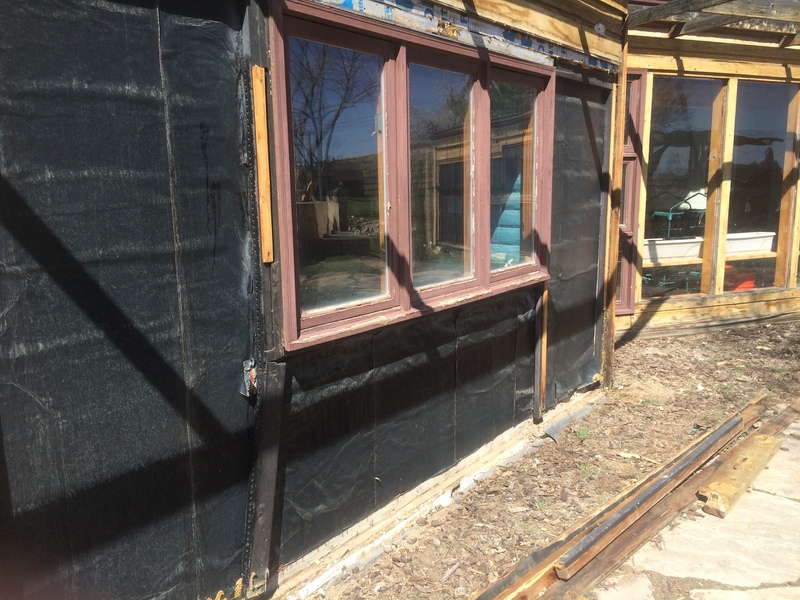 The south facing passive solar windows in the Lovins house are in a deep masonry wall that has a lining of insulation in the middle so we could add insulation to our wall and side it. With or without insulation, the total “effective R value” of a thermal mass wall is more than the sum of its parts due to the heat holding capacity of the masonry. A trombe (TROM–Not trom-BEE) wall is an indirect passive solar device (as opposed to direct, where the sun shines through south facing windows and directly heats the space) that has glazing on the south facing surface to increase the heating capacity of the thermal mass wall. The heat slowly travels to the cooler side of the wall and releases its heat into the building. That balances the direct solar heat and delays the indirect heat for several hours. The thermal wall is usually masonry but water and phase changing walls have also been used. Trombe and a fellow researcher, Michel, built several of these walls into residences in France in the early 70’s. The original design was vented with openings at the bottom and top of the thermal mass wall so air would flow by convection into the heating chamber and back into the house. Later, it was found that the air flow did not add significantly to the total heat capacity and unvented walls were recommended. Many trombe walls in the literature are still described and tested with venting, but our house has an unvented wall. So I concentrated on literature that covered this type. Not only is the wall unvented but it only had a single layer of glazing. Normally the wall is painted flat black and a double pane glazing is installed, but a study in Los Alamos in the early 80’s determined that a “selective surface” on the wall with a single layer of glazing was more efficient. This is a metal, which may be a thin copper or other metal membrane that is coated with a “blackbox” coating. The coating has high emissivity so light is not reflected back to the glass and it absorbs most of the light that shines on it. Selective surfaces are still made by MTI Solar in New Jersey. The membrane was coated with an adhesive on the back and should make very close contact with the wall. Our membrane is dusty because the glass had lost its airtightness. 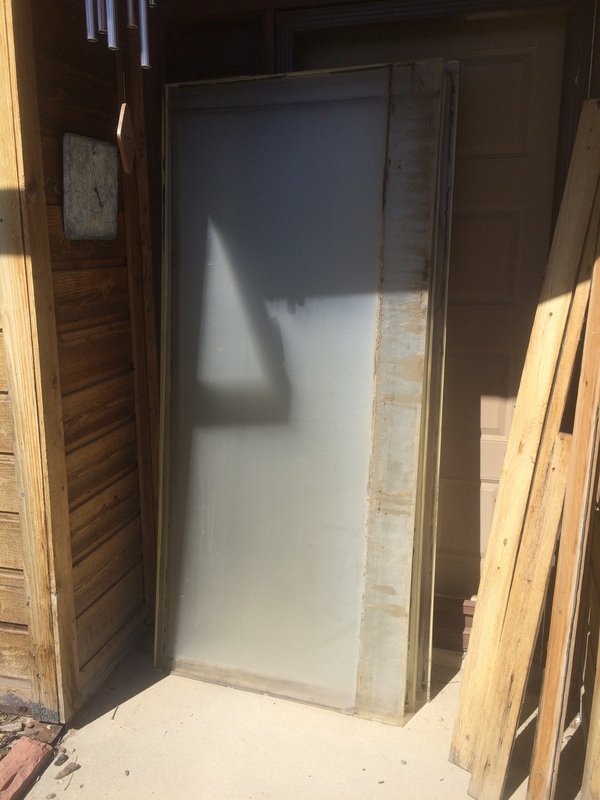 We need to clean and reglue the membrane where it is loose, replace a missing pane, and re-install the glazing with an airtight space between the glass and the wall. I am also looking for a sleeker looking glazing system for the reinstalled glass. I have found two that I will investigate, Conservation Technologies glazing gaskets and US Sky Sure Seal. 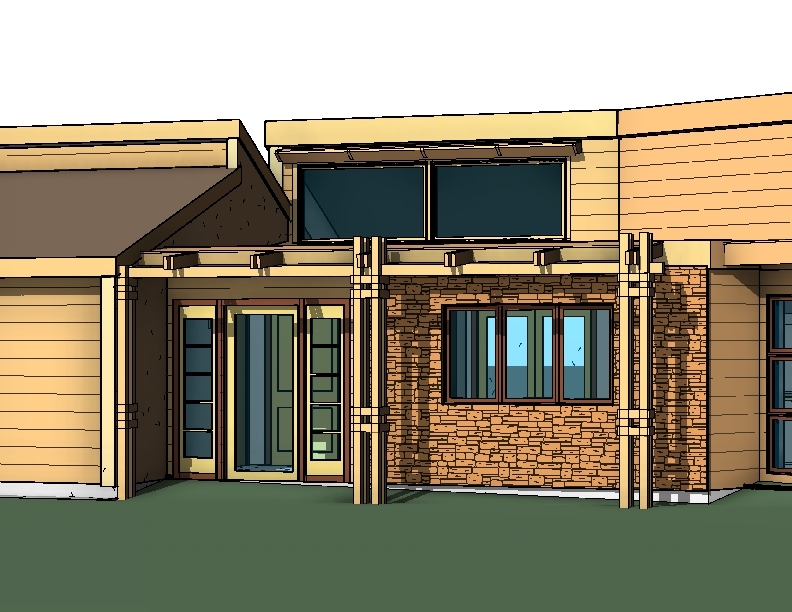 Even though there is a lot of debate about the effectiveness of indirect passive solar heating in the form of trombe walls, from the research I have found the design, well executed, will model as a net energy gain for the house which should help with our HERS rating. 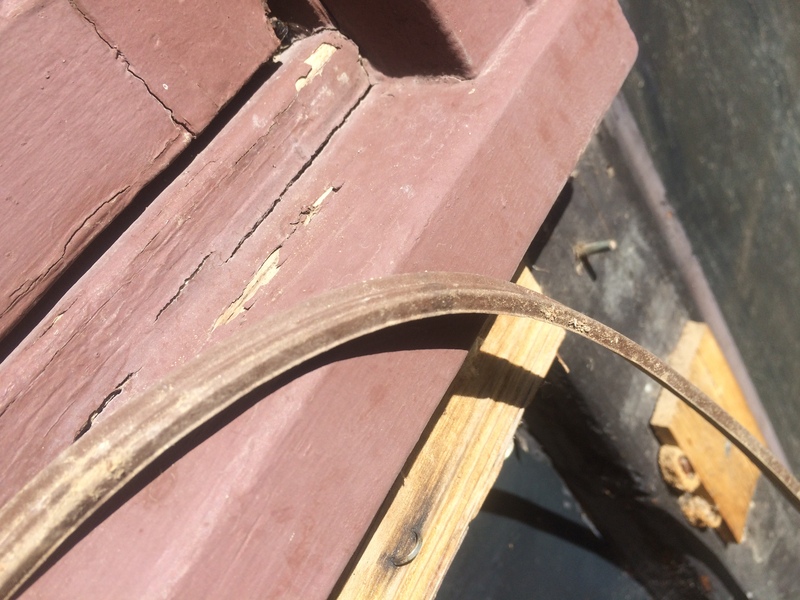 This entry was posted in Air Intrusion/Thermal Envelope, Trombe Wall. Bookmark the permalink.